Is JetBlue guy the next photo-crasher squirrel? Next story in Technotica Is your ex a con? 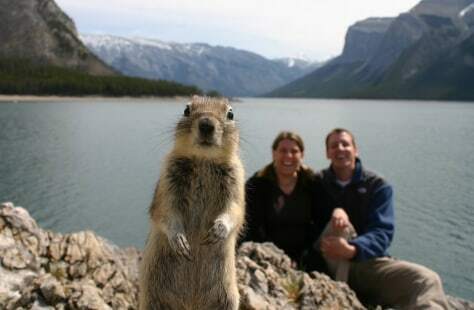 The "photo crasher squirrel" first made its appearance in a holiday photo. Melissa Brandts and her husband, Jackson, of Minneapolis, Minnesota, were taking a time delay picture of themselves in front of a lake at Canada's Banff National Park when the squirrel jumped into the frame. Now the rodent is a Web sensation ... and a brand ambassador for Banff.